Today I'm so happy to welcome the first guest post by Faire Child Weatherwear, a new Nova Scotian children's wear company. They make practical and beautiful outdoor gear for kids, designed with an eye to reusability and style. And it's made in Dartmouth! Encouraging kids to be intrepid and independent, and helping to facilitate those skills, is a principle behind both Faire Child and Bite-Sized Kitchen. Today Faire Child is sharing a food-themed children's book here, as part of their ongoing Book Report series. Thank you so much, Faire Child! Do you have a difficult time finding children's books about food? Books that encourage creativity and play in the kitchen? Well, this book is a little bit of both. This charming story is about little Julia and how she fell in love with French food – both eating it and cooking it. Convinced that life is filled with far too many serious grown-ups, Julia and her best friend Simca begin to develop recipes for growing young. Through the trials of cooking a meal for a table of grown-ups, the girls learn that often adults need some extra help, too, which leads them to develop a cookbook called ‘Mastering the Art of Childhood’. The kitchen scenes and colourful food found in this book will delight those who find kids' cooking references in literature few and far between. 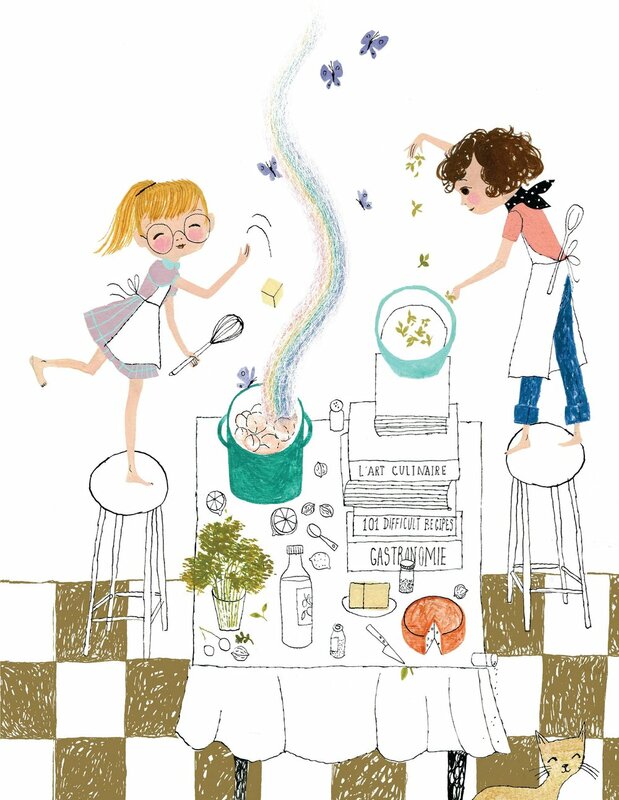 Julie Morstad's delightful illustrations of kitchen tools such as whisks, spatulas, and measuring cups are a highlight. If you’d like to encourage your child to spend more time in the kitchen this lovely book is a great starting point. Read it together and then head to fridge to gather your ingredients!